There’s a rainbow of E number colours out there. But why do we need them added to food and is their role simply to make food look more appetising? Colours are added to foods and drinks for several reasons. As a product is processed and manufactured the natural colour of ingredients may become distorted, lost or faded. So the manufacturers need to add colour to the product to help it look better, more ‘natural’ and appealing to consumers. Manufacturers also find it easier to make products that are uniform or exactly the same as one another from batch to batch. Using food colourings as ingredients help them do this, as it means that set colours have to be added every time to achieve the end result. In other cases, colours are added to make things look better. There are some foods, for example, that would look really bland and unappealing in their natural state, but with colours added it peps them up and makes them look better. You may initially think that all colourings are inevitably fake and artificial, but that’s not the case. There are some that are derived from natural sources, such as E100, which comes from turmeric and E162, which comes from beetroot. But in between there are heaps of other colours that do stem from artificial and manmade sources. Many artificial colours are called coal tar dyes, as they were originally made from coal tar. These days they tend to be synthesised from other sources, such as petroleum. Colours can be used on their own, but often they’re mixed together to make other shades (e.g. blue and yellow colourings make green). In general, all colours are assigned E numbers from 100 to 181, which makes them easier to spot amongst ingredient lists. E100 – curcumin. This is an orangey yellow colour that comes from the turmeric/curcuma plant. 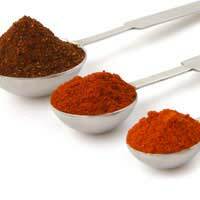 It’s widely used in Indian food, giving curry its distinctive yellow colour, but is also found in products such as fish fingers, ice cream, yoghurts, sweets, biscuits and sauces. E104 – quinoline yellow. This is a yellow colour that can range from dull yellow to an almost greeny yellow. It’s found in products such as ice cream, smoked haddock and scotch eggs. E110 – sunset yellow. This yellow dye is often found in products such as jelly, marzipan, jam, packet soups and ice cream. E120 – cochineal. This is a crimson red colouring that isn’t suitable for vegetarians. It originates from the Dactylopious coccus – a cactus insect – and is extracted by crushing the shell of the insect. It’s found in all sorts of products, such as drinks, biscuits, desserts, sweets and sauces. E133 – brilliant blue. This is blue colouring that is often used alongside E102 (tartrazine) to produce green shades. It’s found in sweets, drinks and processed peas. E162 – beetroot red. This deep red dye is naturally extracted from beetroot. It’s often found in products such as burgers, jam, jelly, sauces, soup, sweets and desserts. E150a – plain caramel. This brown colouring comes from sugar beet or sugar cane. It’s found in products such as beer, chocolate, biscuits, crisps, desserts, fish spread, gravy browning, ice cream, jam, pickle, sweets and soft drinks. This list is, of course, not exhaustive and there are plenty more colourings out there.